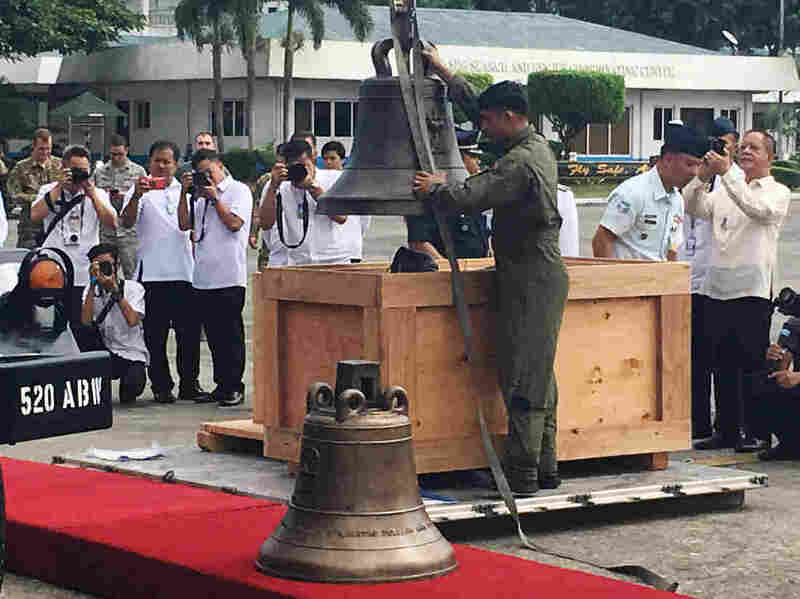 U.S. Returns Balangiga Church Bells To The Philippines After More Than A Century During the Philippine-American War, U.S. troops seized three bells as war trophies. Now the U.S. has flown them back. American troops seized three Philippine church bells as war trophies over a century ago. Now the bells of Balangiga have returned. Updated at 9:29 p.m. ET. After a 117-year hiatus, the iconic church bells of a central Philippines town will ring in the country once again, ending one of the most contentious quarrels between the United States and the Philippines. U.S. soldiers carted three of the Balangiga town's church bells off as war trophies during the 1899-1902 Philippine-American War. The Philippines has argued for decades that it was a historical wrong that need righting. On Tuesday, U.S. defense officials and the ambassador returned the bells to the Philippine authorities at a military base in Manila. "It has been a long road home," U.S. Ambassador to the Philippines Sung Kim said. "It is my honor to be here at this closing of a painful chapter in our history." In the small town of Balangiga, on the island of Samar, the bells have taken on an almost mythical quality. Townspeople are feverishly sprucing up the area for the homecoming. On a recent visit, resident Fe Campanero, 57, said the passage of time has not diminished the significance of the bells. "They represent our quest for freedom. They represent our courage. They represent our faith," she told NPR. Faith would have been sorely tested at the turn of the last century. The United States was the new colonial power: Spain ceded the Philippines to the U.S. at the close of the Spanish-American War in 1898. Filipino nationalists went on to fight the Americans for independence. Balangiga staged a cloak-and-dagger attack on the company of American troops occupying the town. According to historical accounts, on the eve of the attack, Filipino men disguised as women crept into St. Lawrence the Martyr Church past unsuspecting American soldiers to prepare their assault. Campanero says her great-great-aunt was the lone woman rebel in the plot. The Balangiga church bells are unloaded in Manila after being in U.S. possession for 117 years. The following day, the tolling from the bells of the Catholic church signaled the start of the revolt. The native fighters slaughtered 48 U.S. servicemen, two-thirds of the company, as the Americans were eating breakfast. Historian Xiao Chua says the most credible accounts suggest that the Americans did not "wantonly kill civilians." Rather, they destroyed everything else. "Because they were still mad — they burned the village. They killed the animals. They burned crops. Basically, the whole of Samar [island] was turned into a 'howling wilderness,' " he says, using a phrase contained in an actual order. The Americans seized three bells from St. Lawrence the Martyr Church as booty. Two bells were kept at a U.S. Air Force base in Cheyenne, Wyo. The third — which researchers believe was used to signal the fateful attack — has been with the U.S. Army in South Korea. Veterans in Wyoming put up staunch resistance to any return. With friends in Congress, they persisted in holding on to the bells even as consensus was building to "do the right thing," says retired U.S. Navy Capt. Dennis Wright. He argues that any U.S. claim to the bells on the basis of some deep attachment couldn't be justified. Wright notes that in Wyoming the bells had been ignored for decades, sitting in a warehouse unnoticed. In addition, Wright says the U.S. has returned many bells in different conflicts, including to Japan and Russia. It handed the San Pedro bell back to the Philippines in 2016. "These are about the only bells that people didn't want to relinquish," Wright says. "But church bells belong in churches calling the faithful to worship. They don't commemorate military deeds." Speaking in Wyoming last month, Defense Secretary James Mattis sought to assuage those who fear that the U.S. would lose something by returning the bells — saying that "bells mark time, but courage is timeless." He added, "By returning the bells of Balangiga to our ally and our friend, the Philippines, we pick up our generation's responsibility to deepen the respect between our people." 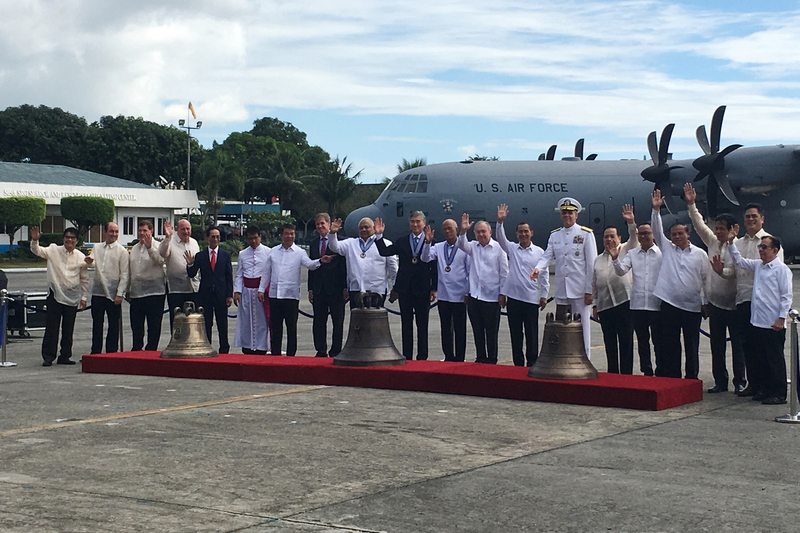 The U.S. flew the bells to Manila in a large Air Force plane that itself is full of symbolism. The aircraft is called the Spirit of MacArthur — named after Gen. Douglas MacArthur, the Allied forces commander who liberated the Philippines from the Japanese in World War II. Will Political Strains Pull The China-Philippines Cozy Relationship Off Course? The gesture comes at a time when the government of the Philippines has been warming up to China. The Office of Philippine President Rodrigo Duterte, who demanded the bells be returned, called their return "a milestone." Duterte is expected on hand in Balangiga later this week, when the bells are brought back to the St. Lawrence the Martyr Church. Campanero says it's time to put painful memories aside. "We cannot rewrite history, but we can end this story on a beautiful note," she says. "Everyone is a winner."